Down a picture-perfect tree lined drive and across a perfectly manicured lawn lies an expansive plantation house whose history dates back centuries. 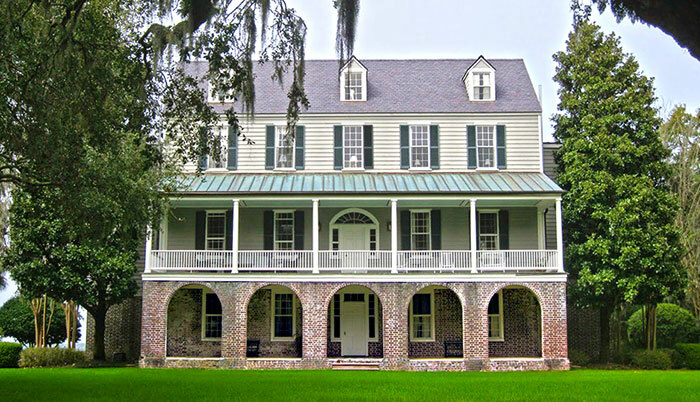 The Arnoldus Vanderhorst Mansion was the main residence on a South Carolina plantation that, at different points in time, extended across the whole of Kiawah Island and was bordered by the Kiawah River, the Stono River, and the Atlantic Ocean. The island was settled by the English in the late 1600s, and the property changed hands several times until 1771 when it was willed, and divided into two, to Mary Gibbes and Elizabeth Vanderhorst (wife of Arnoldus Vanderhorst), by their grandfather John Stanyarne. 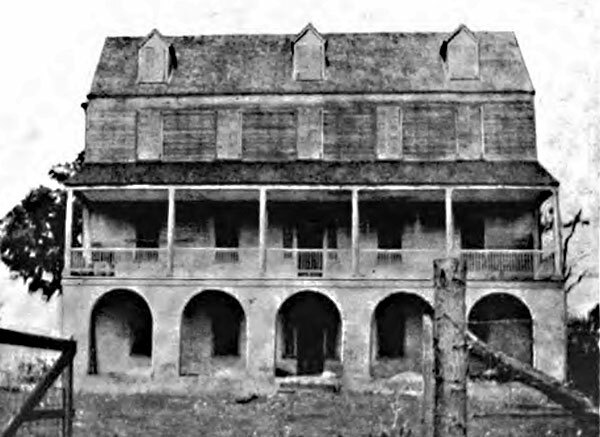 Stanyarne had acquired Kiawah Island in 1717 and raised cattle and indigo on the island plantation in the 1700s. The Vanderhorst family was established in South Carolina towards the end of the 17th century. Gen. Arnoldus Vanderhorst (or Vander Horst) was a Revolutionary War hero, Charleston mayor and South Carolina governor from 1794 to 1796. During the Revolutionary War, Vanderhorst served as a colonel under General Brigadier Francis Marion; Marion is remembered as the "Swamp Fox," one of the fathers of modern guerilla warfare. The 18th century period film, The Patriot, was structured around Marion's military feats. Vanderhorst was a Christ Church Parish, S.C. plantation owner, in addition to owning properties in Charleston and the plantation on Kiawah Island. He built this house in 1801, replacing the original plantation structure destroyed by the British during the American Revolution. At this time, Vanderhorst began cotton production on Kiawah Island and the slave population rose from 13 to 113. Vanderhorst Mansion in the early 20th century with its piazza. This fine example of early coastal architecture featured an arcaded brick foundation in Flemish bond, which was an adaptation of similar designs imported from Barbados. Particularly well-proportioned, the arches were both spacious and balanced, creating a graceful rhythm across the south facade. The five bays of the arcade were repeated in the windows of the two stories directly above, establishing a distinct horizontal movement. 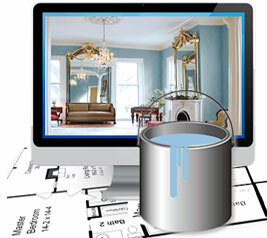 This design was a necessity in the damp hot climate of the coastal South Carolina Lowcountry. Living areas were located above the arcade to ensure better ventilation and to protect against high water. The interior floor plan was symmetrical with central halls on all floors. After the Civil War, Arnoldus Vanderhorst IV returned to cotton production at the postbellum Vanderhorst plantation. The Vanderhorst family retained ownership of Kiawah Island until 1951 when C.C. Royal purchased Kiawah from the Vanderhorst estate to use for logging and timber. In 1974, the heirs of C.C. Royal sold Kiawah to an investment corporation and a master plan for the development of a private residential community and golf resort was drawn. Vanderhorst Mansion in the late 20th century without its piazza. Vacant for most of the 20th century, the Vanderhorst Mansion was abused as a barn to store hay, had its piazza removed, and its main stair balustrade stolen. 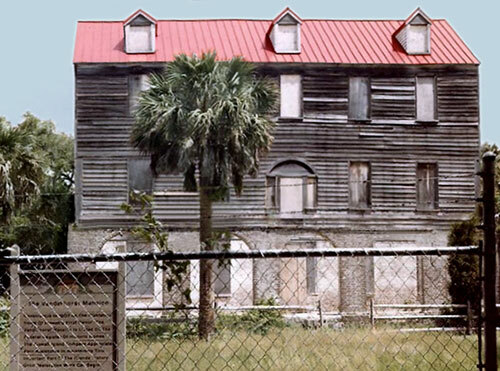 Old photos show that the plantation house was in a deteriorating condition for decades. Nevertheless, the house was listed in the National Register of Historic Places in 1973. Rear View with Glass-Walled Additions. 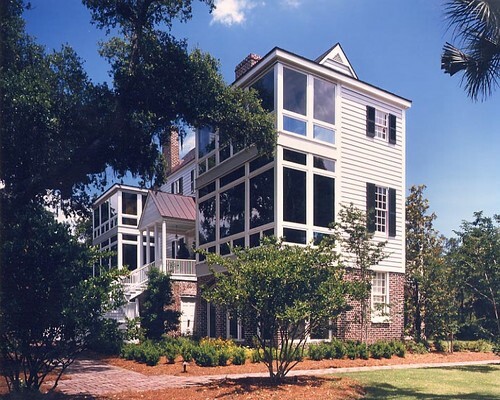 REFERENCES: "Arnoldus Vander Horst House, Charleston County (on Kiawah River, Kiawah Island)". National Register Properties in South Carolina. South Carolina Department of Archives and History. Retrieved July, 2015.